Roma dump Barça out of Champions League. 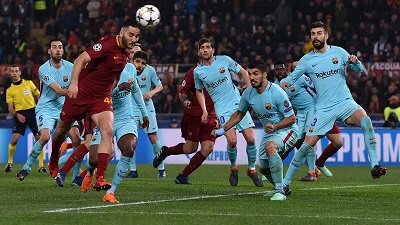 AS Roma produced one of the greatest Champions League comebacks after defeating FC Barcelona 3-0 at the Stadio Olimpico to earn a 4-4 aggregate draw and reach the semi-finals on away goals for only the second time in their history. The goal were from Edin Dzeko in the 5th minute, followed by De Rossi’s penalty in the 57th minute before Manolas scored the crucial third in the 82nd minute to dump the Blaugrana out of the Champions League. AS Roma are the third side in Champions League history to overturn a three-goal deficit in the knockout stages after the first leg. FC Barcelona and Valverde will have till Saturday to lick their wounds before hosting Valencia at the Camp Nou as they now shift their attention to league play. AS Roma: Alisson; Manolas, Fazio, Juan Jesus; Nainggolan (El Shaarawy, 76′), De Rossi, Strootman, Florenzi, Kolarov; Dzeko & Schick (Ünder, 72′). Previous PostBarça defeat Leganés and match unbeaten record. Next PostBarça defeat Valencia 2-1 and break all-time La Liga unbeaten record.